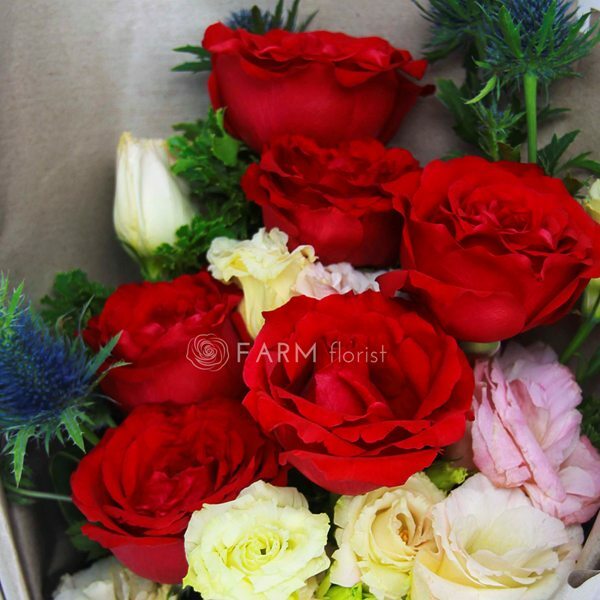 FARM Florist is an online florist that specializes in free same day flower delivery in Singapore. It is amazing to note that they have decent looking bouquets as cheap as 35 SGD, inclusive of delivery. However, what is more amusing is the fact that they offer full refunds for all deliveries that arrive more than an hour late. In recent years, we have seen some reputable online florists receive a lot of negative publicity online due to issues with regard to fulfillment. This term of a refund due to late delivery serves as great guarantee to all potential customers. Some may even place an order and hope the bouquet arrives an hour late! It is also worth noting that as of January 2019, they do not have any review on Google that is less than 5 stars. Their website offers many stunning looking flower bouquets. even during the Valentine’s Day season. 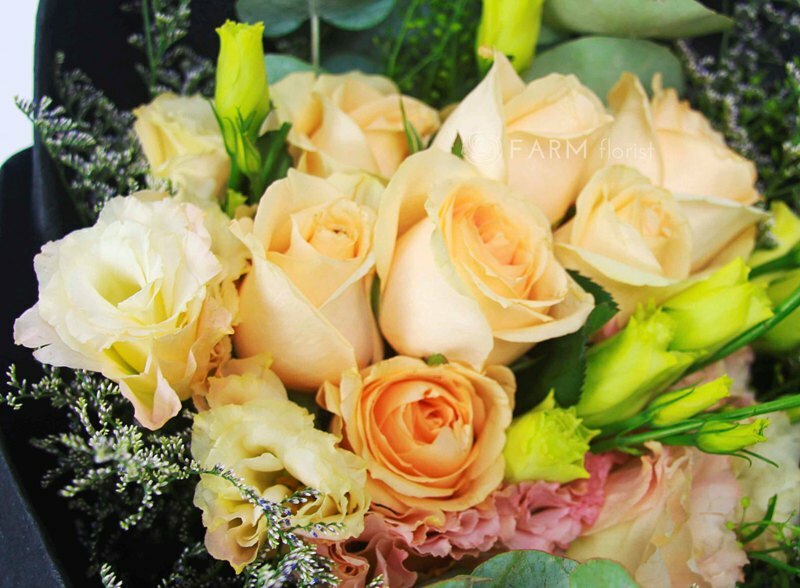 As the name of this business suggests, Roses Only specializes in super pretty long stem roses that reach an impressive 65 cm in length, beautifully packaged to delight any recipient. They are known for delivering only top quality roses that may be accompanied with other gifts (such as a bottle of wine, a box of chocolates, or even scented candles) upon the customer’s request. It is common for online florists to use roses from India or China due to the fact that they are more economical. Roses Only however, choose to use roses only from Ecuador, where the climate and conditions allow for the roses to be much bigger in size. At Roses Only, flowers are priced from 39 SGD onwards and delivery is an additional 9.95 SGD per order. Happy Bunch is an up and coming name in the florist industry. They have managed to become a hot favourite among many because their bouquets are priced at a shocking rate of 35 SGD with free delivery. It is best to go with Happy Bunch if you happen to be one who is very fickle minded. They curate different designs each day so every bouquet will be a surprise. It is believed that this has allowed them to achieve minimal wastage and be able to cater to a large volume without having to worry of missing out on any order. Made someone angry in the wee hours of the morning and feel some fresh flowers would do the trick? Lucky for you, you have 24 Hr City Florist to go to. They offer free delivery if your delivery requirement is anytime within 9 am to 5 pm, and they charge up to 45 SGD for urgent deliveries at literally anytime of the day. The best part about these guys is that they can deliver with a notice as short as 2 hours. Their variety is insane and they do not just make flower bouquets. Gift baskets, flower stands, and flower arrangements are all within their standard catalogue range online. A unique online florist specializing in bouquets you do not really see on any other florist on this list. They have an Old Chang Kee Bouquet that features all your favourite deep fried snacks tastefully wrapped in the form of a bouquet with kraft paper. They also have sunflower bouquet with a bottle of Pokka Green Tea smacked in the middle, and Chocolate Snack Bouquet featuring all-time favourites such as M&M’s, Kinder Bueno, and Hershey’s. Their bouquets are typically around 97 SGD and they provide next day delivery with an additional 20 SGD charge. Petite Fleur is home to a collection of many rustic looking bouquets. Their mini bouquets are quite a popular option going at just 30 SGD. Delivery would cost you an extra 10 SGD. Being specialized in bouquets of a rustic design would also suggest that they would have a good number of selections that are made of dried flowers. These dried flower bouquets are actually really practical as the recipient need not chuck the bouquet into a bin just after a few days. They can simply unwrap it, place them in a glass jar, and admire them forever. The establishment of new online florists has been very rampant in recent years. Being established as early as 1980, Arcade Florist is extremely experienced in delivering a good bouquet. Being the usual go to place for those primarily situated in the Central Business District of Singapore, they have now opened their doors to delivery. Their standard island wide delivery is 30 SGD. Should you need something to be delivered within 3 hours, they can get you covered at just 35 SGD for urgent delivery. Another local gem offering free next day delivery. The bouquets at Fleur De Style may be a little pricier than other websites online, but we believe that their passionate work would provide you with guaranteed satisfaction. They are committed to using materials of the highest quality and would never short change a customer just to maximize their profits. Worth giving a shot for sure! Valentine's Day is just days away! 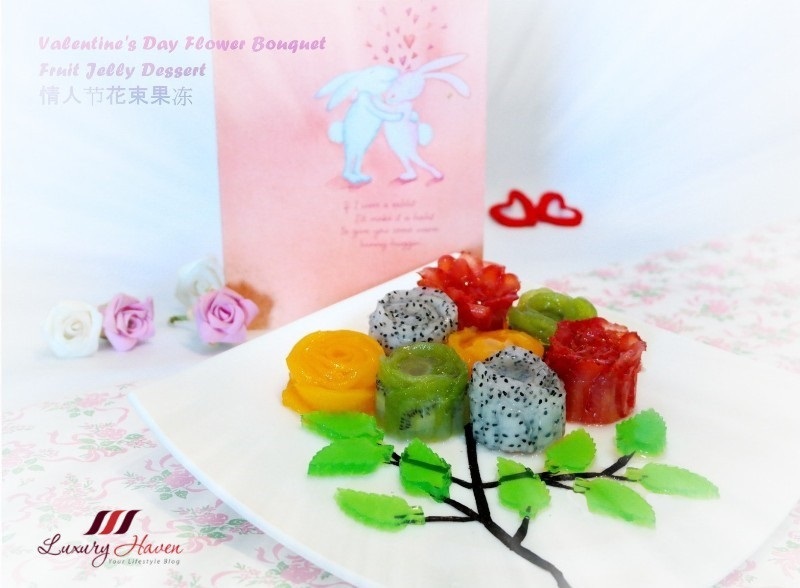 Or how about making your own Flower Bouquet Fruit Jelly Dessert ( 情人节花束果冻 ) for your loved ones? This special occasion is so much more than just about showing your affection. It is a time to value those who have always been there for you. Here's wishing all a Happy Valentine's Day! Good guide for people who wants to send flowers. Looks like some marvelous options! Those roses are spectacular!!! Perfect for the coming Valentine's day! The flower is so so beautiful, but my only problem is will they be able deliver them to people out of their country. thanks for sharing, the flowers look beautiful. It's good that there are a range of reliable flower delivery services available in Singapore so you don't always have to rely on one. Thanks for sharing these flower shops. This comes handy as I have lots of relatives and sick uncles living around Singapore. I need to send flowers soon.